Indeed, when freshman Patrick Izett sent a laser-beam blast from 35 yards out into the top of the net with under 10 minutes remaining in a mid-October home conference test against Thompson Rivers, the ripple effect was palpable. Second-year Connor Guilherme in the 88th minute and then rookie Mihai Hodut in the 89th would follow with goals. Just like that, the box score masqueraded as a comfortable win. 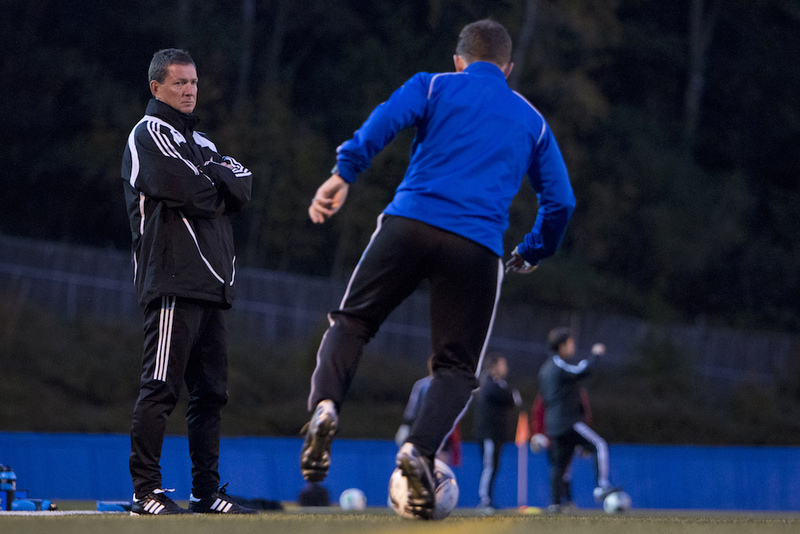 Relying on such cardiac moments has certainly not been the norm for UBC men’s soccer under its longtime head coach Mike Mosher. Yet the veteran field general, coaching his 22nd season at UBC, is feeling no less satisfaction over a campaign which, despite being filled with high drama, produced a Pacific Division-leading 10-4-1 record. “It’s probably the youngest group I’ve ever had, and we started a lot of freshman and gap-year (19-year-old) guys,” said Mosher, whose team needed an overtime goal from fourth-year Kyle Sohi to beat Calgary’s Mt. Royal Cougars 2-1 last week to both keep its pulse and earn the right to host the conference semifinals. And on Thursday, when the Canada West honoured its best by handing out its season-ending hardware, UBC’s youth stood front and centre. 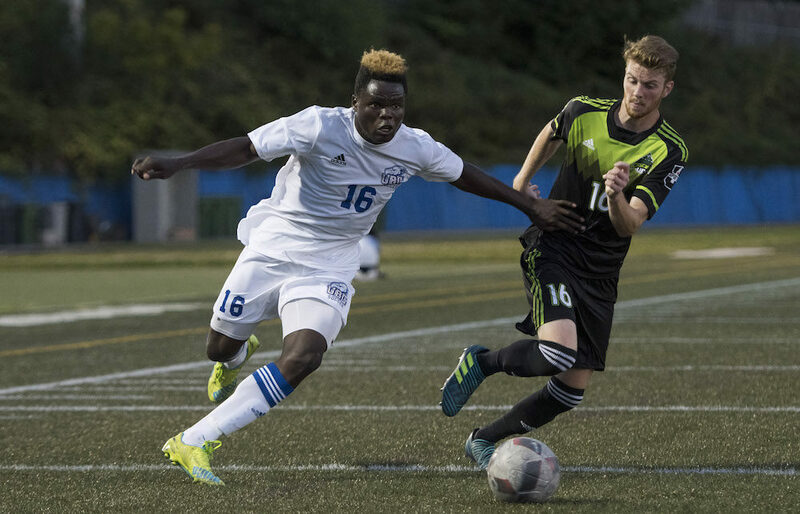 Prolific marksman Victory Shumbusho was picked Canada West Rookie of the Year in addition to earning a spot on the conference’s first all-star team. Guilherme made the second all-star team, and Izett joined Shumbusho on the all-rookie team. 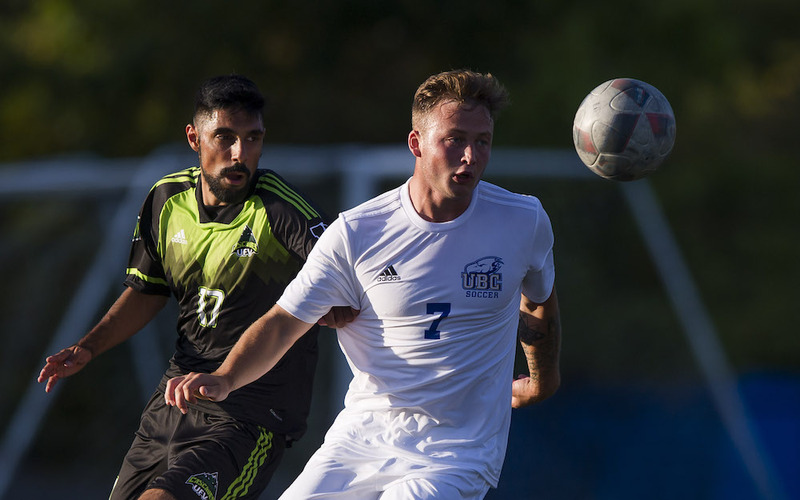 UBC’s first point of focus, however, is facing a team which gave them no end of trouble this season. Kamloops’ Thompson Rivers WolfPack (6-3-6), making their first conference semifinal appearance ever, will face the ‘Birds in a 7:30 p.m. match Friday at Thunderbird Stadium. The evening opens at 5 p.m. with Trinity Western (8-4-4), led by conference Coach of Year Mike Shearon, facing No. 3 Alberta (9-1-4). The two winners will clash Saturday (8 p.m.) with the winner advancing to the CIS nationals (Nov. 9-12), which this season are being hosted by the WolfPack. UBC, in fact, could say the same for the rest of the field. Its only draw came against TRU (2-2) in a match in which they trailed 2-0 at halftime. 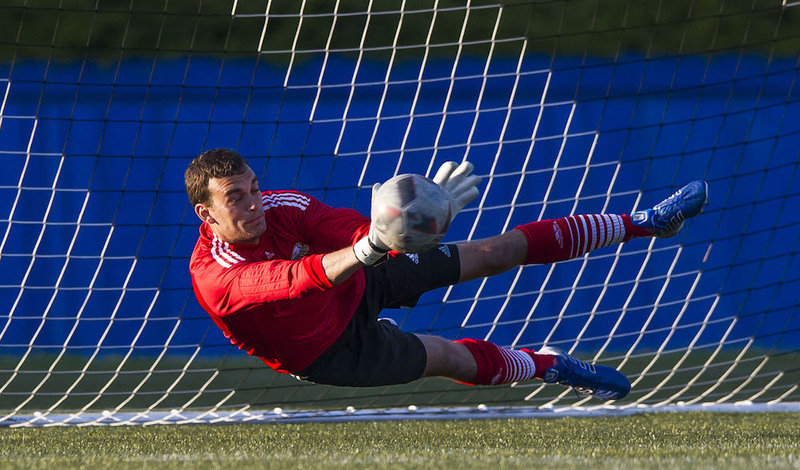 And of its four losses, UBC fell 1-0 at Edmonton to the Golden Bears, and split with TWU, winning 1-0 and losing 2-1. The ‘Birds only loss at home this season, however, was a 2-1 decision against Victoria. From his spot in net, Bush says that as the young core meshed with main body of returning players over the course of the season, one thing stood out to him, over and above the fact that the rookies delivered on their immense skill. “Look at our roster and the only graduating player is me,” said Bush, who is listed as a third-year but actually started his career in the NCAA at Duke and later played professionally in Ottawa. Bush hopes to be back with UBC next season but admits much of his decision will be made by where he begins the next phase of his academic life. When a student-athlete is willing to balance that kind of academic-athletic load, you know it’s a special place to play. After all, it’s a team which can potentially return every member of its 2017 roster, yet has sacrificed nothing to once again, be in the moment as the stretch drive to national glory begins. As the host of the U Sports national tournament, Thompson Rivers is already guaranteed a berth in the field. However, if the WolfPack win the Canada West Final 4, the second-place finisher would also advance to nationals.